The prodigal son is a character in a parable or story Jesus told about the grace and forgiveness of our heavenly Father. These activities are about this parable. In the Parable of the Prodigal Son, Jesus taught us what it means to really forgive. This story illustration will help kids understand and remember this important Bible story. The illustration can be used in Sunday School, homeschool or a classroom setting. 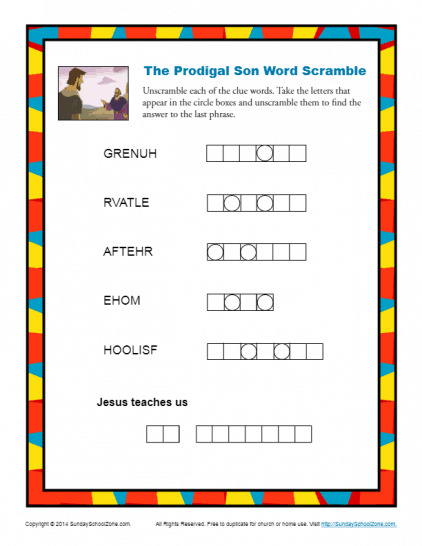 This word scramble, based on Luke 15:11-31, will help kids learn about the love and forgiveness of our heavenly father. It can be used in a homeschool setting, one-on-one, or in a classroom setting like Sunday School. 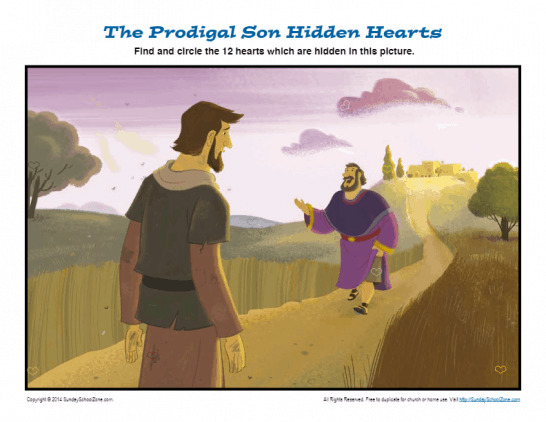 This hidden picture activity, based on Luke 15:11-31, will help kids learn about the love and forgiveness of our heavenly father. It can be used in a homeschool setting, one-on-one, or in a classroom setting like Sunday School. 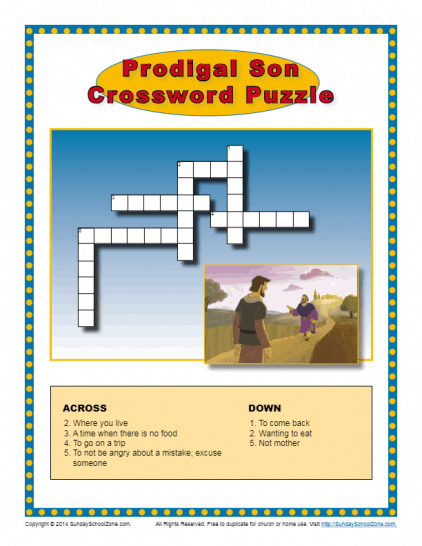 This crossword puzzle, based on Luke 15:11-31, will help kids learn about the love and forgiveness of our heavenly father. It can be used in a homeschool setting, one-on-one, or in a classroom setting like Sunday School. 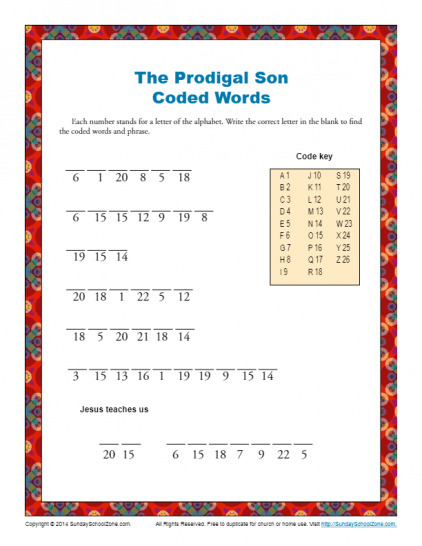 This coded words activity, based on Luke 15:11-31, will help kids learn about the love and forgiveness of our heavenly father. It can be used in a homeschool setting, one-on-one, or in a classroom setting like Sunday School. The prodigal son had a tough time, but his difficulties were of his own making. When he came to his senses and returned home, his father forgave him and welcomed him as his son. 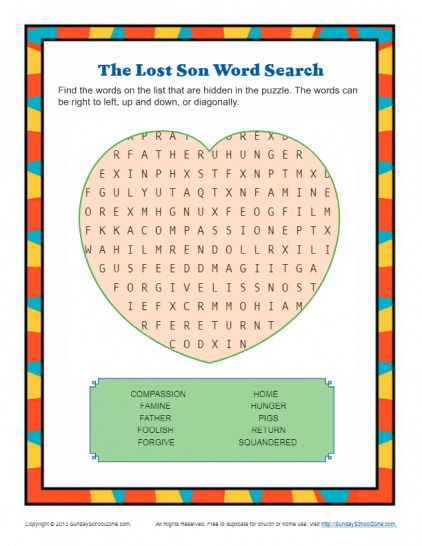 This word search puzzle challenges children to find 10 words associated with 10 elements in Jesus’ parable. This is a fun and educational activity! 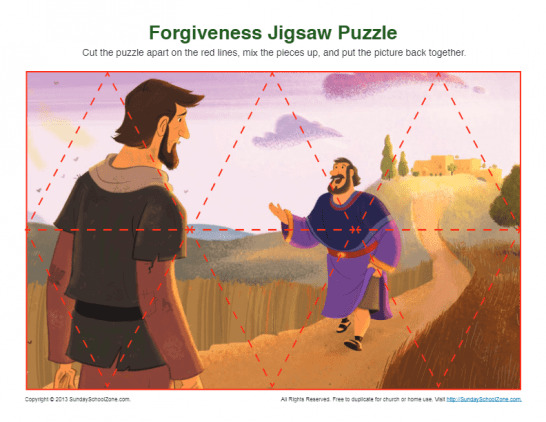 This jigsaw puzzle highlighting the parable of the prodigal son is a great reminder of the joy God has when a sinful individual repents and comes to Him in humility. God forgives! God loves! How to the 14 triangles fit together? In a way that reminds us of how wonderful God is! 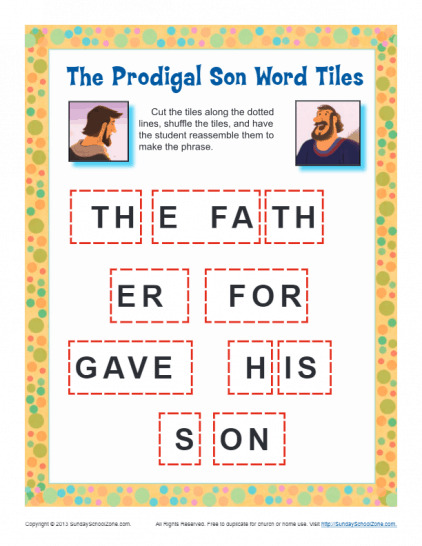 These word tiles, properly placed, communicate an important truth highlighted in Jesus’ parable of the lost son: “The Father forgave his son.” God will forgive us as well when we come to him and are sorry for our sins. 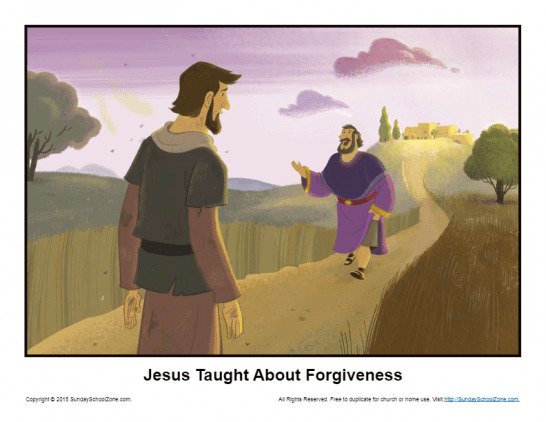 Use this activity to help your children learn about God’s love and forgiveness.